"Big Ben" Roberts-Smith laughs at the showers as the Bellingen Magpies and Army Thunder prepare to take the field. 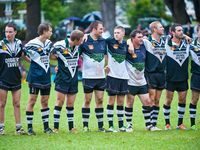 A CROWD worthy of a Group 2 Rugby League grand final packed Bellingen Park on Saturday for a thrilling and poignant tribute to Australia's defence forces. 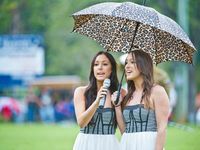 They'd braved the rain and alternating showers to attend the annual Sgt Matthew Locke MG Memorial match between Australian Army Thunder and the Bellinger Valley-Dorrigo Magpies. 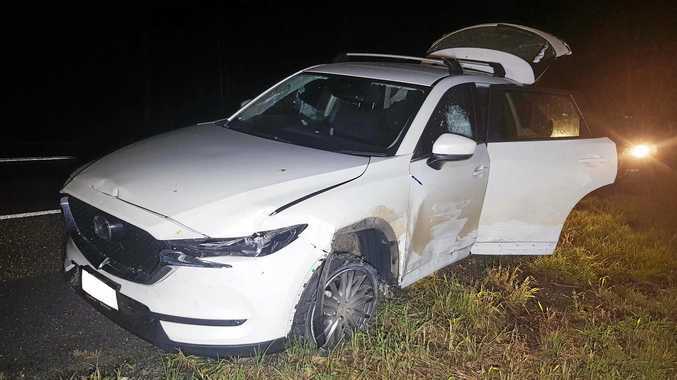 Bellingen president Steve Glyde admitted he was shocked by the size of the roll-up in those conditions. On and off the field, it was the biggest and best staging of the event since the first in 2009 when the Magpies sent the Thunder crashing to that team's first ever defeat. 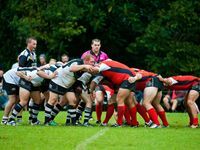 On this occasion, the visitors were victorious 34-18 but not before both teams put on a magnificent display. Against a much bigger and fitter side, the Magpies played a super brand of attacking football that will lead the club to plenty of wins in the upcoming season. Only fatigue in the latter stages proved their undoing. 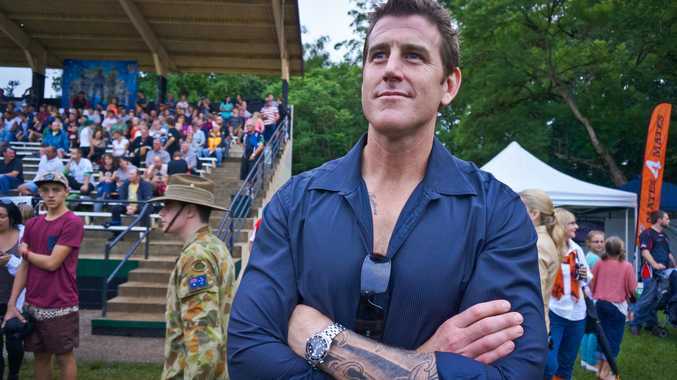 Meanwhile, former soldier Ben Roberts-Smith VC, MG, was a towering presence on the sideline. He and Matt "Grub" Locke were close army mates before the former Bellingen footballer was killed in action in 2007. "I can say from the heart, we want to thank everybody who braved the weather and came out to pay tribute to Matt," Ben said. "Matt was a great soldier and great family man. "He was a fine representative of all who are on active service in Afghanistan." As a sign of the growing importance of the day, Footy Show identity Erin Molan attended the match to shoot an Anzac Day special for the program. Erin is the daughter of Major General (ret.) Jim Molan who was a guest at the match in 2010. Family spokesperson Debbie Locke was also excited by the turn-out to remember her late brother. "It was an awesome display of top grade rugby league," she said. "Thanks to Danny Buderus, Michael Crocker, Brett Finch and Jason Ryles for making the journey up here to play as guests of the home team. "And we're all looking forward to seeing that Footy Show Anzac Day special."